I had totally forgotten to show you the items worn by the one person who I consider to be the coolest (clothwise) in the house. It is the master of leggings and slim fit trousers. I so wanted to buy this fabric but decided not to as the little one really did not need anything. And then the 6-year-old chose this particular fabric out of a million fabrics online for his new trousers! What good taste. Not sure, if you can actually recognise it but this time I even made pockets at the back. The girl has grown, too, so here are her trousers. And last but not least, I made another attempt in being cool by upcycling the carneval costume. She was dressed as a witch and we made a black dress for this purpose, already knowing that it would be altered afterwards. I cut the fringe, made an normal hem, pink cuffs and ironed on some stars that I had cut out of plot foil to add some colour to the plain bl.. bl… it is really hard for me to say that…. black dress. That’s if for now, it looks like Me Made May is around the corner, so I quickly need to get ready and jump on board in an other post. I know, I know, a little later than usual, but it is still Sunday. It was World Books Day this week, so time to get dressed up as favourite book character. Which is quite clearly mistaken by some as favourite TV character. I saw a lot of Disney princesses and Superheros plus one Yoda. But I was lucky. I asked them: What’s your favourite book? 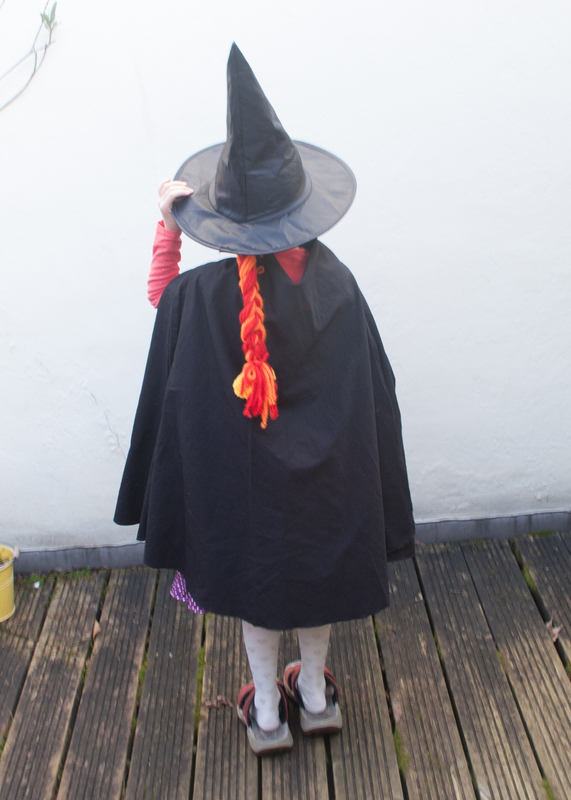 I explained: – Look, for example P wants to be the witch from Room on the broom…. – I want to be the dragon, I want to be the dragon. Technically, the witch costume is not exactly a scrap project. I had to buy just about everything. Well, the yellow bow (hiding behind the hair) and the ginger plait are made of scrap wool (see, I am still knitting). And we had the hat since ages. Obviously I could have made a simple purple skirt but I wanted to use the opportunity to practice piping as I will need it for the final garment in my Fashion Course. The dragon however is entirely made of scrap. 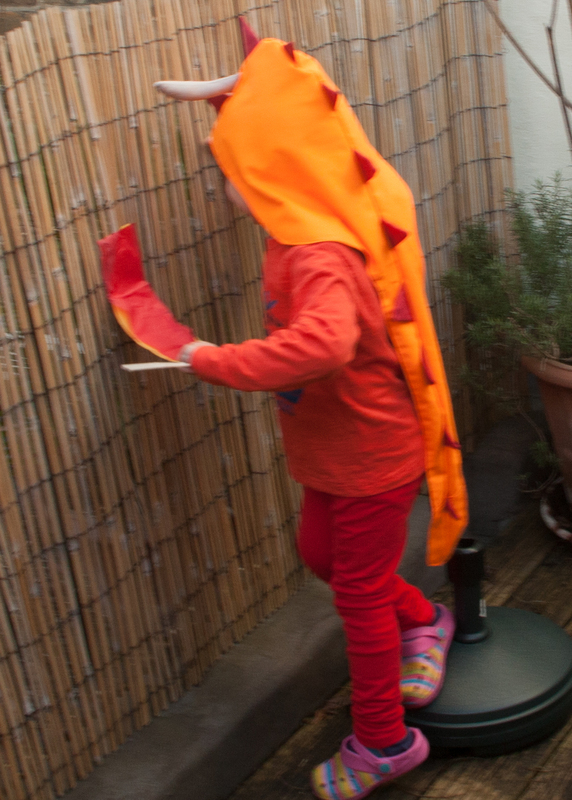 I have used the left over from the carrot costume and some other red and orange fabric scraps. First of all I cut out some sets of red triangles plus some strong interfacing. I sewed them together and turned them inside out. I also made a stuffed grey horn similar to the one the dragon in the book has on his head. For the main “body” I used a hood pattern and just elongated it at the back into a long tail. I pinned all the spikes and the horn on one side and stitched the two body parts together. I decided to line it with some dark red left over lining as it makes the whole costume just so much more sustainable. 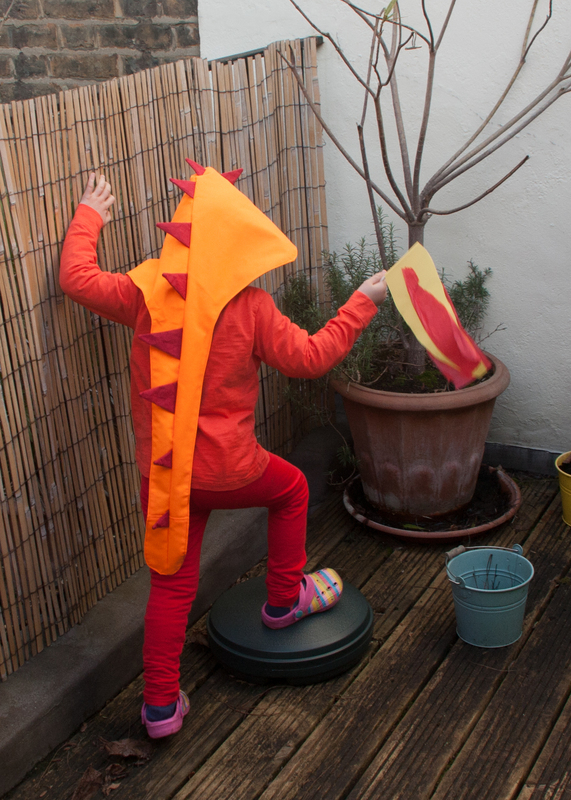 As you can see, the horn does not quite stand up but the dragon was happy and so was I.
I did not want to make a full costume because… well it would have been far too much work really but also we needed something practical to be able to play in the nursery and its garden. And in case if you were wondering why he carries a flag, obviously this is not a flag but a portable fire to breath out fire. Because this is what dragons do. I am extremely pleased with the result of the whole costume making. The child inside misses the carnivals of my childhood I guess. 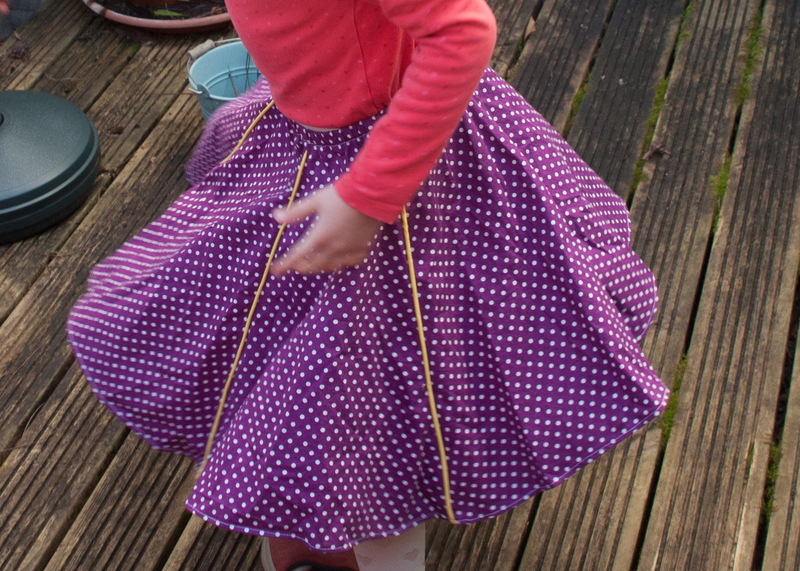 It has been very little work (apart from the skirt) with maximum outcome plus the children could help with some of it. Obviously the skirt is too elaborate for a costume only but it was a good opportunity and I made it to be worn on many occasions.